Earlier this year, San Rafael released its report  on parking demand in east San Rafael and found it sorely lacking. There were far too many cars for the space available, leading to overflow into other neighborhoods and constant frustration for its residents. Yet while the report detailed significant outreach and study of the problem, the recommendation for more parking was sadly lacking. Without a discussion of demand management with car sharing schemes or new bike infrastructure, the report could only go so far. East San Rafael includes the neighborhoods of the Canal, Spinnaker Point, Baypoint, Bahia, and Kerner, as well as a commercial area south of Larkspur Street that the Census largely lumps in with the Canal. Image from W-Trans, "Figure ES-1 - Study Area" in East San Rafael Parking Study, 2017. Parking demand throughout most of the study area is way above the 85 percent generally seen as full utilization. In the commercial area, the Canal, and Bahia, people regularly double park, with utilization rates as high as 124 percent. In all, the survey reports a roughly 636-space shortage if 85 percent occupancy is the goal (though the writers gave a shortage of 582 spaces, apparently aiming for 100 percent occupancy). Image by the author, data from the US Census, ACS 5-year Survey 2015. 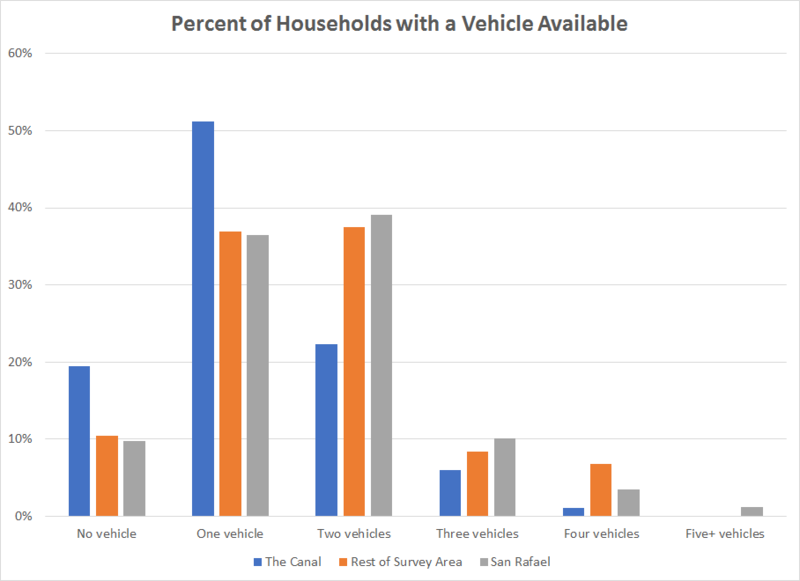 From combining the Census data and the survey data, we find that there are somewhere around 1,300 cars that need to be parked long-term in the Canal. That represents half of the entire public parking inventory in the whole survey area. The Census data is unfortunately too granular to determine how many might be needed in the eastern half of the area, but it’s likely to be roughly similar. Amazingly, survey respondents said they’d be willing to pay for parking long-term parking or parking passes despite their low incomes. This implies that parking and mobility are incredibly important to car owners in this part of the city, so much so that they would be willing to pay more to have it secured. The study shows a shortage of 636 parking spots if 85 percent occupancy is the goal (though the writers were apparently aiming for 100 percent occupancy, as they give a shortage of 582 spaces). Given the importance of car access to residents of the study area, attempting to tighten regulations on parking through permitting or stricter enforcement would likely hurt low-income car owners without any significant reduction in demand. Increasing transit access through more heavily discounted passes wouldn’t help either, as Marin Transit already discounts transit use by low-income riders. Building parking lots may be a reasonable solution for long-term parking but most of the proposed spots are far from the areas of greatest need. As well, they only provide about half the shortfall. Finally, the study authors avoid any discussion of parking demand mitigation except through the lens of public transit. Bicycling and carshare are not mentioned once, nor are the transportation needs (destinations, travel times, and so on). The simplest way to manage demand is to get people to sell their cars by giving them a better option than driving. While transit, walking, and biking are often cited as ways to do that, car sharing might be most effective in east San Rafael. While the research is thin, one report found that around 20 percent of people buying into carshare end up selling at least one of their cars  . A scholarly study from 2010 found that the average number of vehicles per member household is cut by half . I couldn’t find any reports on whether this was more likely among low-income members, but it stands to reason that they would be more likely to sell if given the opportunity. Further, the relatively large number of infrequently-used vehicles in the study area seems ripe for carsharing. The problem with plans like ZipCar or other carshare companies is that they are not priced well for low-income residents. The one ZipCar in San Rafael costs $10.75 an hour to use, up to a maximum of $79 per day. This is steep for someone with limited income, but might be helpful for people east of the Canal. For Canal residents, a subsidized plan may be more feasible, especially if significant numbers of residents lack credit cards (a requirement for company membership). Los Angeles rolled out BlueLA, an electric car-share system targeted to low-income residents, with charges by the minute and steep discounts for low-income members. If a similar scheme were paired with a variety of vehicle types (large cargo and passenger vans, sedans, and trucks) it could significantly cut parking demand in east San Rafael. We can’t know how big of an impact a car sharing scheme would have without knowing the details of how many households would subscribe. However, we do know that the approximately 3,000 households in the area have somewhere around 4,100 cars and that there is a 636-space shortage. If a quarter of households subscribe to the service, and 25 percent of those give up a car, parking demand would drop by 260 cars, or about 6 percent. If the average number of cars per member household drops by half, that would be a 430-car drop, or 10 percent. That may seem like small potatoes, but that’s between one-third and two-thirds of the need. A truly long-term solution, but not an outlandish one, would be a pedestrian swingbridge or drawbridge over San Rafael Creek at some point east of the yacht harbor, as proposed by the 2009 Canalfront plan [7, PDF]. This would significantly speed walking and biking access to San Rafael High School, Montecito Plaza, and the rest of the Montecito neighborhood. It would require obtaining easements on either side of the creek, but it would not be impossible. Left: A swing bridge in Cape Town, South Africa. Right: A pedestrian drawbridge in Ogunquit, Maine. Image Credits: TripAdvisor, Victoria & Alfred Waterfront. Fornarotto, Perkins Cove Ogunquit Maine. Attempting to implement parking policy while only looking at supply is entirely insufficient. For low-income people, it simply reinforces the fundamental inequity that comes from making driving mandatory. The W-Trans report focused exclusively on those supply-side solutions and came up with a plan that only solved half of the problem. If they had done their due diligence and explored demand-side options, they would have found a complete solution that also expanded transportation options for Marin’s most in-need community. San Rafael should seriously examine carshare, bicycling, and even a bridge to determine how each would affect parking demand and transportation within its eastern neighborhoods. A holistic solution is the only way to answer those neighborhoods’ needs. W-Trans, “East San Rafael Parking Study” (San Rafael, CA: City of San Rafael, May 11, 2017). “2014 American Community Survey 5-Year Estimates,” American Community Survey (Washington, DC: U.S. Census Bureau, 2015). Susan Shaheen and Adam Stocker, “Carsharing for Business - Zipcar Case Study & Impact Analysis,” Information Brief (Richmond, CA: Innovative Mobility Research, July 27, 2015). Elliot Martin, Susan Shaheen, and Jeffrey Lidicker, “Impact of Carsharing on Household Vehicle Holdings: Results from North American Shared-Use Vehicle Survey,” Transportation Research Record: Journal of the Transportation Research Board 2143 (December 2010): 150–58. Eva Heinen, Bert van Wee, and Kees Maat, “Commuting by Bicycle: An Overview of the Literature,” Transport Reviews 30, no. 1 (January 2010): 59–96. John Parkin, Mark Wardman, and Matthew Page, “Estimation of the Determinants of Bicycle Mode Share for the Journey to Work Using Census Data,” Transportation; New York 35, no. 1 (January 2008): 93–109. “San Rafael Canalfront Conceptual Design Plan.” San Rafael, CA: City of San Rafael, December 2009. Fornarotto, Jerry. Perkins Cove Ogunquit Maine. November 28, 2012. Digital Photograph. TripAdvisor. Victoria & Alfred Waterfront. n.d. Digital Photograph. W-Trans. “East San Rafael Parking Study.” San Rafael, CA: City of San Rafael, May 11, 2017.